There are many ways in which the same combination of facts can be ‘packaged’ in sentences. Pupils need to be aware of some of the main options for varying the structures within a sentence, for example by using subordinate clauses and passives. These options allow information to ‘flow’ through a sentence so that it is clear which parts are most important. They also improve the flow of information within the whole text, because they help the writer to integrate each sentence with those on either side of it. Understanding the effects of different sentence structures on meaning is important for KS3 pupils not only as writers and speakers, but also as readers and listeners. This unit is concerned with signalling the relative importance of different parts of the total message. ideas expressed in main clauses are usually more important than those in subordinate clauses and phrases – importance is related to subordination. information given later in a sentence is usually more important than that given earlier – importance is related to word order. In general, the more like a complete sentence a structure is, the more importance it receives in the sentence. Information in clauses is more important than information in phrases. Information in main clauses is more important than that in subordinate clauses. Information in finite subordinate clauses is more important than that in non-finite clauses. Co-ordinated words, phrases or clauses are equally important. she was feeling discouraged – the ‘discouraged fact‘. She was working and she was feeling discouraged. She was working but she was feeling discouraged. She was feeling discouraged but she was working. Although she was feeling discouraged, she was working. Although she was working she was feeling discouraged. Although working she was feeling discouraged. While working, she was feeling discouraged. The general principle is that sentence structure reflects importance. When we write, we try to establish links in the reader’s mind as quickly as possible. So the context – what the reader already has in mind – determines the most effective word order. Mary had been working for hours. She was working in spite of feeling tired. Mary had been working for hours. In spite of feeling tired she was working. Mary felt exhausted after a bad night. In spite of feeling tired she was working. Mary felt exhausted after a bad night. She was working in spite of feeling tired. This means that what comes first tends to be information that we know already, so it is less important than what comes later. Ordinary main clauses and subordinate clauses offer a convenient range of different solutions to the problems of signalling importance, but there is also a range of special patterns that expand the range of possibilities even further. There is a large cat in your garden. A large cat is in your garden. In your garden is a large cat. 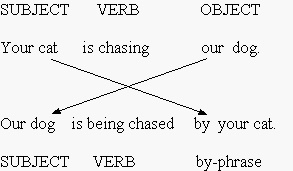 In this pattern the basic subject is delayed till the end of the sentence where it can have greater importance. However another element has to move out of that position, so the two elements swap places. Lying in the sunshine were two large cats. At the end of the field stands a stately oak tree. At last I found the entrance. Lying on top of it was a large stone. Some things you forget. Other things you always remember. You forget some things. You always remember other things. Front-shifting reduces the importance of the front-shifted element, which then provides a context for the rest of the clause and may link back to the preceding sentence. At the moment, I’m hoping to get a bus back. Later on, she’s coming round. Our dog is being chased by your cat. Passive verbs allow their basic object (our dog) to become their subject. Our dog is being chased. Passive verbs make the style ‘impersonal’ only in the latter case; if their active subjects are expressed they are no more impersonal than active verbs.